Lung cancer symptoms - People with a specific cancer usually don’t realize that they have cancer until the malignant cells have spread to other part of body, and here we are going to talk about lung cancer symptoms. 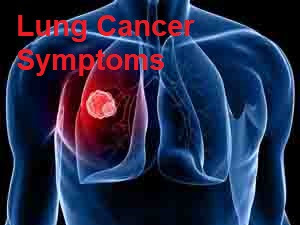 In case for lung cancer, its symptom won’t reveal until the cancerous cells spread to other organ. So it is important for people to report to doctor if there are any unusual feelings, physically. In relation to lung cancer, unusual feelings can sometimes be connected to bronchitis. Speaking in short words, you should check the body if it is worrisome or it has anything unusual. The major cause of lung cancer would be that of a habit of smoking. Smokers do have greater chance of having lung cancer, and also people who exposed to smoke. However, it doesn’t mean that every patients of lung cancer are smokers. There are people who never smoked but having the disease. It means there is no clear cause that could explain why the disease occurs in one’s body. In most cases, lung cancer won’t trigger any symptoms and signs particularly in its earliest stages. That’s why it is difficult for people to detect the cancer until it becomes worst. A genetic test will be required if malignant cells are found in the examined tissue sample. The result of test will help doctors or specialists to choose the best-possible treatment for patients. It is not easy to detect lung cancer, but one can learn to recognize these lung cancer symptoms so that s/he can take some acts of prevention.